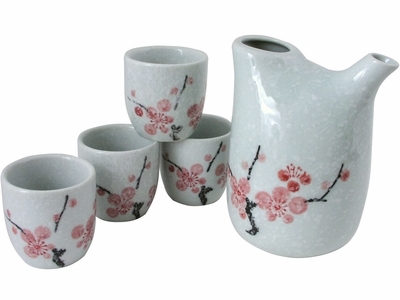 Made in China and crafted from ceramic, this traditional sake set features a unique sake jug with four beautifully matching sake cups for the enjoyment of your favorite sake in the company of friends. Beautiful design of cherry blossom branches in pink is featured in this traditional sake set adding a romantic air. Cherry blossoms are well loved in Japan for their beautiful yet short bloom. Cherry blossoms are a poetic reminder short-lived and transient beauty. Glazed to a smooth and glossy finish, this traditional sake set features a unique sake jug that features two openings, one for filling with sake, the other for the serving of sake. Perfect for sake enjoyment in winter and spring, this traditional sake set makes the perfect gift for sake lovers. Hand washing is recommended for this item.